At our May commencement, more than 4,900 students joined the ranks of our vibrant, already 270,000-strong alumni community. These most recent graduates have embarked on a new phase of their lives, one of professional achievement and community leadership—one we have prepared them for with a world-class education. We must keep our promise to deliver that same excellent education to subsequent generations of University of Iowa students. Our faculty, current and future students, staff, and state should expect nothing less. In order to do so, we need to recruit and retain excellent faculty. We do have world-class faculty, and we have high-quality, world-renowned programs, but at the moment, many of our best are being successfully recruited to other institutions—often those in our competitive peer group, which includes not only the Big Ten universities, but also UCLA, North Carolina, Arizona, and Texas. Vying for the best faculty with institutions like these requires significant resources, and we have fewer and fewer at our disposal. 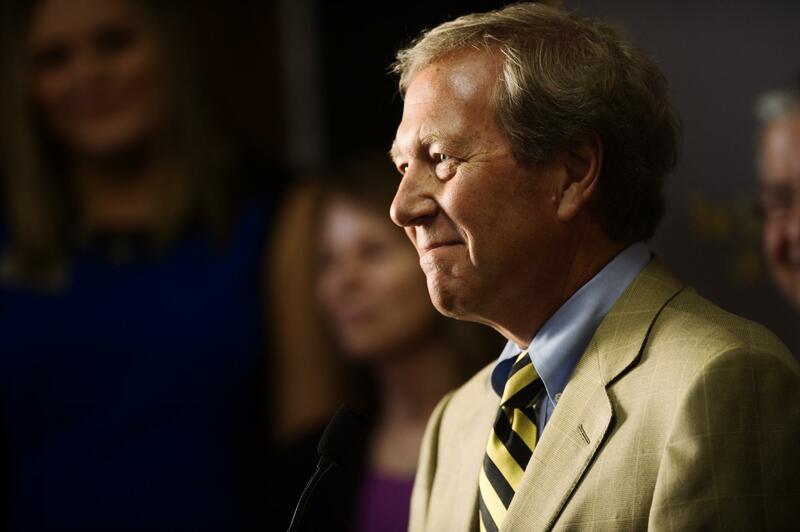 Though the university faces fiscal challenges, President Harreld says the UI must “keep our promise to deliver (the) same excellent education to subsequent generations of University of Iowa students.” Photo by Tim Schoon. We have been consistently responsible with the resources we do have. Our costs have not escalated out of control, and we have upheld our mandate to provide a world-class education to our students. Indexed for inflation, for the past two decades we have managed to spend approximately the same amount per student each year on their education; during that time, we improved the four-year graduation rate by almost 20 percentage points. What has changed is who pays for the University of Iowa: The proportion of state funding in the General Education Fund has dramatically declined over the past 15 years. Now we are at a breaking point where mere cost efficiencies are no longer sufficient. What it means to hold a degree from the University of Iowa depends entirely on the ongoing quality of the institution. Low tuition may be good for students in the short term, and I know that for some, paying tuition, room, and board, is already a challenge, but if the quality of the education that their alma mater provides declines, the value of their degree—no matter how hard they themselves worked or researched or who they studied with—may change. We can take our university and our state to new heights, but not if we continue to lose our current faculty or are unable to recruit new talent that can successfully compete with that of our institutional peers. That is why we seek new revenue from the citizens of our state and our students, as well as increased grant funding and support from our donors. Being the best in Iowa is no longer sufficient. Our students, alumni, and the citizens of this state deserve and expect more. I will fight as hard as I can for the University of Iowa in the next legislative session, and with your continued support, I am confident we will deliver on those expectations.